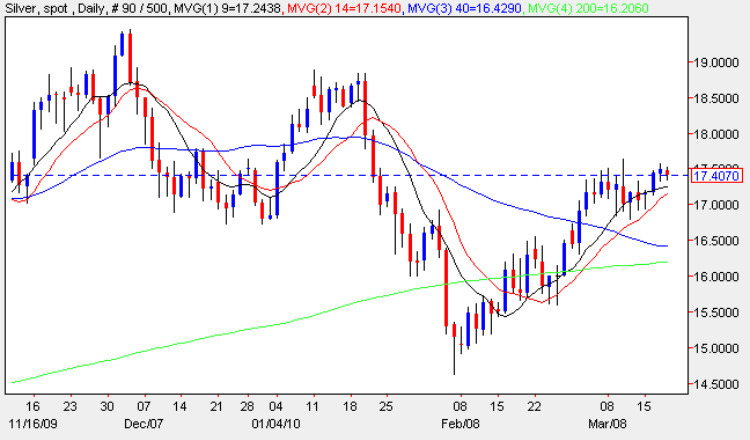 The spot silver market continues to grind its way higher, with yesterday’s narrow spread up candle edging above the deep resistance in the 17.50 price area, as the recovery in spot silver prices continues following the sharp sell off in late January and early February. With the close of yesterday finishing above all three moving averages once again, the short term bullish sentiment remains firmly in place with both the 9 day and 14 day moving averages providing excellent support to the move higher. Having broken above the resistance area yesterday, this is adding to the positive picture and with all four moving averages now below, we should see the move continue with added momentum in due course. To the upside, any significant move higher will have to overcome the deep potential resistance between $ 18 per ounce and $19.50, but should this region be breached then we can expect to see spot silver prices break out above this level and target the $20 per ounce price point in due course. With equity markets still performing well as investors increase their appetite for risk, this should help spot silver prices ease higher in due course, as demand for silver increases once again in line with its industrial status and growing demand worldwide.